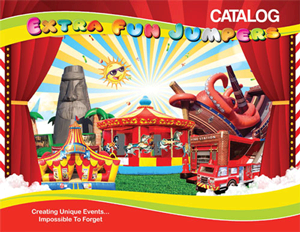 Extra Fun Jumpers is now publishing a print catalog for our corporate event planners, business partners and large event specialists. You can preview an Online version of the catalog below. Just click on the pages or arrows and you'll be able to flip through the catalog pages just as if you hand a copy in your hands.